The Milwaukee Bucks put the Los Angeles Lakers into an even deeper hole in the NBA on Tuesday. Los Angeles fell to Milwaukee 115-101, making their postseason dreams all the more unrealistic. It was the Lakers' fourth straight loss. The Bucks entered the matchup coming off a loss to the Philadelphia 76ers, but handled the opposition without Giannis Antetokounmpo, who sat with an ankle injury. LeBron James also did not play in the contest, as he was dealing with a sore left groin. Kentavious Caldwell-Pope was the unlikely star, pouring in a game-high 35 points for the Lakers off the bench. 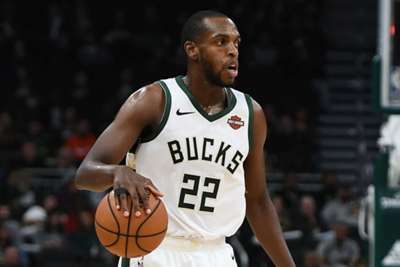 Milwaukee were led by Khris Middleton, who contributed 30 points and 10 rebounds. The Lakers look even more unlikely to make the playoffs now as the Bucks continue to assert themselves as a dominant force. The Eastern Conference-leading Bucks will face the Cleveland Cavaliers on Wednesday, while the Lakers will host the Brooklyn Nets on Friday. James Harden tallied 31 points, eight rebounds and 10 assists in the Houston Rockets' 121-105 triumph over the Atlanta Hawks. Ben Simmons recorded a game-high 28 points, eight rebounds and five assists to help the 76ers top the Charlotte Hornets 118-114. Stephen Curry scored a game-high 36 points as the Golden State Warriors took down the Minnesota Timberwolves 117-107. D'Angelo Russell scored 27 of his career-high 44 points in the fourth quarter of the Brooklyn Nets' 123-121 comeback victory over the Sacramento Kings. Mike Muscala scored two points on one-of-six shooting in the Lakers' loss to the Bucks. The Kings' De'Aaron Fox threaded the needle with a perfect bounce pass to Buddy Hield against Brooklyn. De'Aaron Fox threads the needle to Buddy Hield! Andrew Bogut executed an effortless behind-the-back pass to find a wide open Curry under the basket in his second game back with the Warriors. Boston and Philadelphia are two of the most dangerous teams in the Eastern Conference. The Celtics sit in fifth in the standings while the 76ers have ascended to third.